Sunday my husband and I were honored to serve the fantastic people of The Gathering: he let God speak through his rhythms on the drum kit, I let God speak through my paint and brushes on canvas. I can’t tell you how amazing it is to bring our different forms worship to the Lord together. It re-confirms what we were truly created to do, and reminds us how much God wants us to partner with him in it. Th only directive I was given for the painting was that the message would be centered around things that crowd into our lives and distract us from our main focus: God. As the band practiced for worship that morning, I wrote out a list of things that can be the worst culprits. As I completed the list, I realized how upside-down our thinking is…we let our lives get consumed by obligations, chaos and insanity…when really, if our heart’s focus was simply on God, He would bring peace into our chaos, and become our source of sanity. I felt the edges of vision for the painting starting to materialize: two hearts in juxtaposition…one filled with the list of words I’d written out…but there was one missing element: what to put inside the other heart. I talked it over with the hubs, and we batted a few things around. But as I leaned in and positioned my heart to really “listen”, I felt a strength and clarity begin to take shape. The words that kept rattling through my soul? 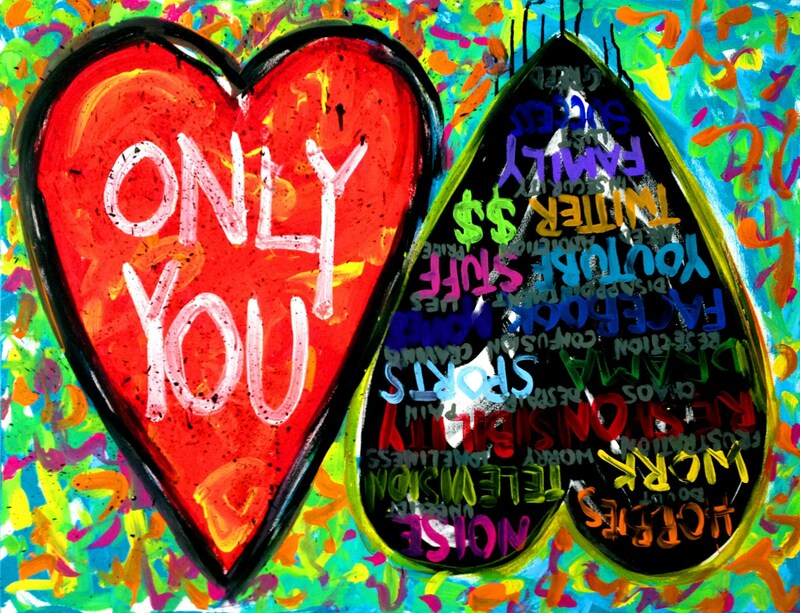 ONLY YOU. It was only the second time I’d painted during the sermon and not during worship, but there was such a sweet peace about this being the visual representation of the word being given. 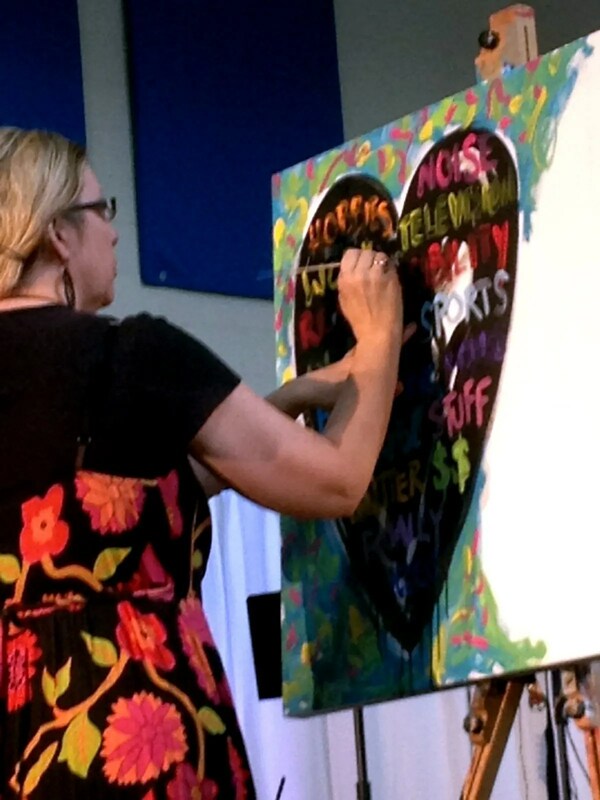 I finished the first heart, flipped the canvas and began to paint the second heart…only to hear the pastor emphatically say, “The thing we should be saying to God is: ‘ONLY YOU, God…ONLY YOU!’” There it was. The kind of moment that only the Holy Spirit can orchestrate. In sports, the refer to it as the “sweet spot”…in photography, it’s “the money shot”. In this situation, it was the undeniable realization that God truly is the source of all inspiration and creativity. Not to overstate the obvious, but I entitled the piece, “Only You”. 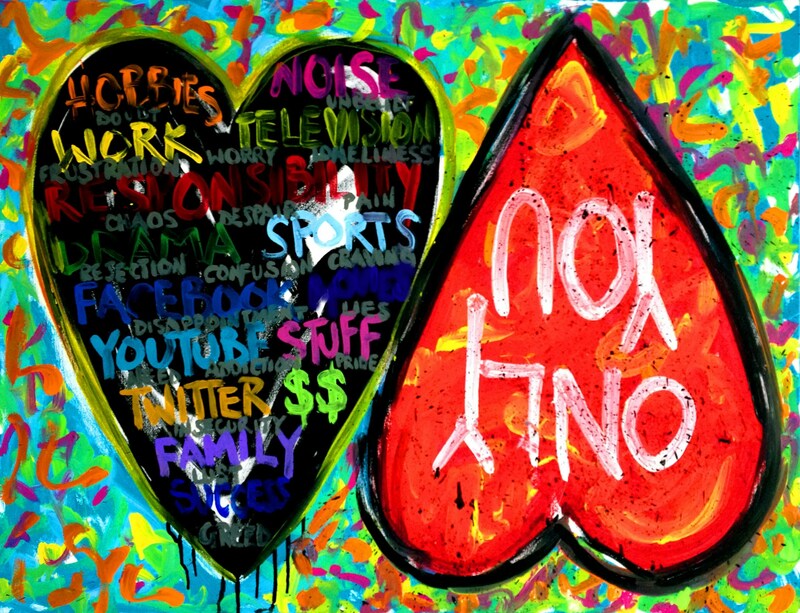 I’m posting the painting in both positions, so that you can read the words of distraction that crowd God out of our hearts.